My grandmother was diagnosed with cancer in late June of 2001. Her experience of hospice was a revelation. It made me – personally – less fearful of death. Grandma was dead by the end of July. This is what she wanted – she feared the loss of her quality of life. She was famous for wearing crazy tights and high heels into her eighties. On her way to a party, she would stop to pull up a weed. I remain convinced she knew she was sick long before she went to see a doctor. Grandma entered hospice care almost immediately. She was the wife of an Episcopal priest/Theology Professor at a liberal arts college. (He had died several years prior). She had been privy to many deaths and now here she was arriving at her own. She seemed resigned. I remember that she was bothered by little things like not knowing what would happen about Mrs. Landingham on The West Wing. Over the course of days and weeks people who loved her began appearing. Christie Achebe, wife of the writer Chinua Achebe appeared with a huge Nigerian stew I can still taste. There was a lot of food coming into the house. So too were there offers of help and assistance – rides to places, errands run. People offered to do anything they could to help. One person stopped by to make sure everyone who wanted to get there had been able to – that airfare was not an issue. “Because I can take care of that,” she said and burst into tears. “Let us know what we can do,” they said. Someone came to weed the garden. People sent flowers. All those people – all those activist helpers DID so much to make my Grandma’s hospice just exactly the death she would have wanted. I remember being devastated, but I also remember those weeks as a kind of tragic magic. My far flung family came together. We lived through death together. Old friends brought us food to eat. It was July and my grandparents’ house was right outside a coursing, light-flecked waterfall and the smell of elemental humidity, earth, and water washed us all clean. The exquisite pain of loss was made immeasurably better by the hospice care Grandma received. The last memory I have of her being conscious was when my cousin arrived with his infant – Grandma’s first great grandchild. Grandma tried to reach for her infant hand. I remember how my brother, just off a plane from the West Coast, entered the room weeping. 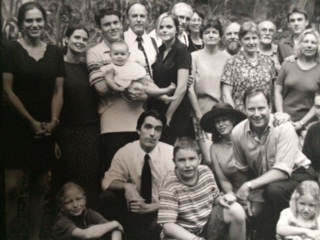 Our extended family surrounded Grandma. We were bolstered by the helping community in such tangible ways. Hospice nurses gathered us outside. They explained that her breath was slowing down. When she died, it had been raining and the sun came out. We all went for a walk. We laughed as hard as we cried.